Maserati revealed the first Levante built around a V8 engine at the New York International Auto Show. 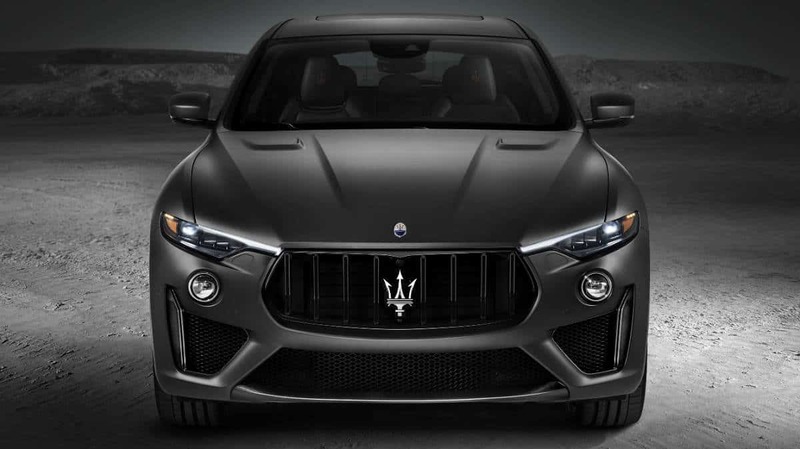 It is the Levante Trofeo, the ultimate Maserati of SUVs, capable of accelerating in style from 0-100 km/h in 3.9 seconds and reaching a top speed of over 300 km/h. The Levante Trofeo is equipped with one of the most powerful engines ever fitted in a Maserati. A 3.8-litre Twin Turbo V8 engine that has been engineered to perfectly mate with the Q4 Intelligent All-Wheel Drive System and delivers an astounding 590 hp at 6,250 rpm and 730 Nm of peak torque at 2,250 – 5,000 rpm. The engine boasts the highest output per litre (156 hp/litre) of any Maserati powerplant ever produced and, like all Maserati gasoline engines, is assembled by Ferrari in Maranello, Italy. The chassis of the fastest Levante ever has been tuned to handle the higher power output and provides an exhilarating driving experience with no compromise in terms of comfort. This tuning ensures the Levante Trofeo continues to embody the essence of the Maserati GranTurismo philosophy with supercar performance. 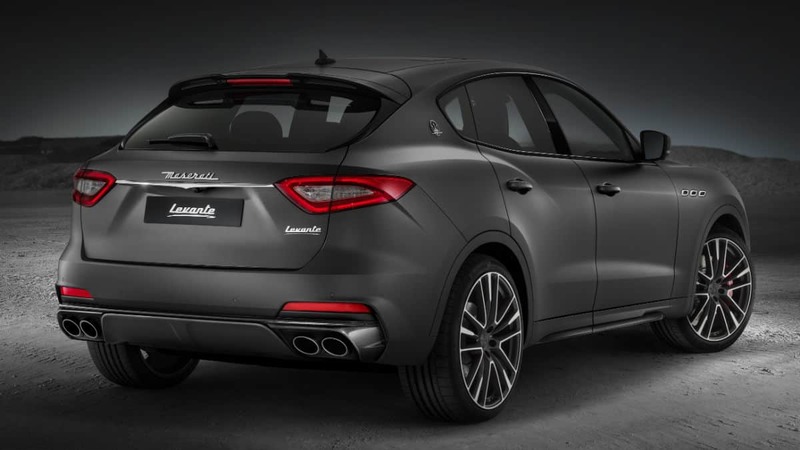 The unmistakable Levante design has reached new levels of sportiness in this top of the line Trofeo. The elegant restyling was mainly focused on the lower front fascia and the rear bumper and is underlined by the 22-inch forged aluminum “Orione” wheels – the largest ever fitted on a Maserati – available in both polished and matte finishes. The side air intakes in the lower fascia feature a new, more aggressive design, defined by two aerodynamic wings that give a sense of further stability, visually “pushing” the weight of the car’s nose towards the massive front wheels. And to help improve the airflow distribution, Trofeo is outfitted with carbon fiber side bezel blades and a carbon fiber splitter. 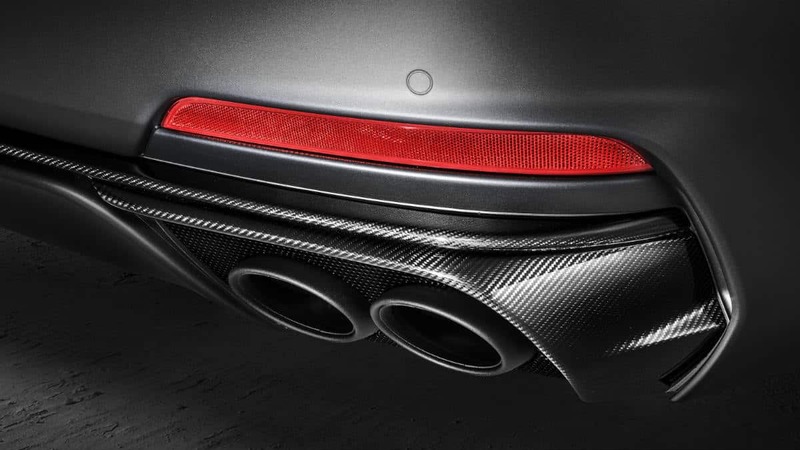 The rear end also looks wider and more muscular with a sharper carbon fiber horizontal element and body-color lower extractor that embraces the oval quad exhaust tips. In front, the Levante Trofeo has Full Matrix LED headlights, a front grille with double vertical bars in a piano black finish and lower honeycomb mesh fascia, as well as body color door handles, oval exhaust tips in a dark finish and performance painted brake calipers in red, blue, black, silver or yellow. And to cap it off, specific “Saetta” Trofeo logos adorn the iconic c-pillars of the coupé styled SUV. Specific details, like the lower splitter, the blade side bezels in the front air intakes, the side skirt inserts and the rear extractor are made of ultralight, high-gloss carbon fiber, giving the Levante Trofeo a polished racing look. Even the hood is new, featuring two aggressive vents for better cylinder head cooling. And under the hood, the engine cover is also made of high-gloss carbon fiber featuring a V8 inscription and the iconic Trident logo, while cylinder heads and intake manifolds are painted red. Interior designers have come up with elegant ways to create a distinctive environment within the Levante Trofeo cabin. 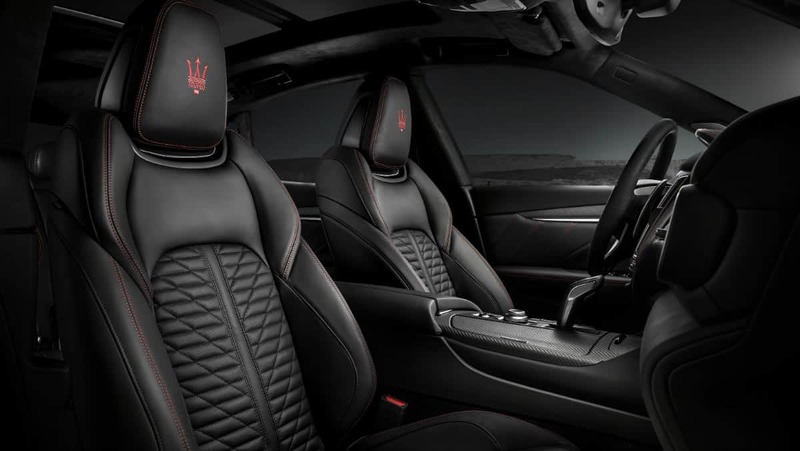 The sculpted sport seats feature a premium full-grain “Pieno Fiore” natural leather available in black, red and tan, all with contrast stitching and “Trofeo” logo stitched on the headrests. “Pieno Fiore” is like no other leather used in the automotive industry for its natural, soft feel and for the unique character it develops throughout the years. A new matte carbon fibre trim and paddle shifters, specific instrument cluster graphics, floor mats with metal Trofeo badges and a Maserati clock with a unique dial elegantly underline the exclusive sporty character of this extraordinary Levante, which is outfitted with a standard 1,280-watt, 17-speaker Bowers & Wilkins premium surround sound audio system for exceptional listening enjoyment. The production of the Levante Trofeo starts this summer at the refurbished Maserati plant in Mirafiori (Turin), Italy. 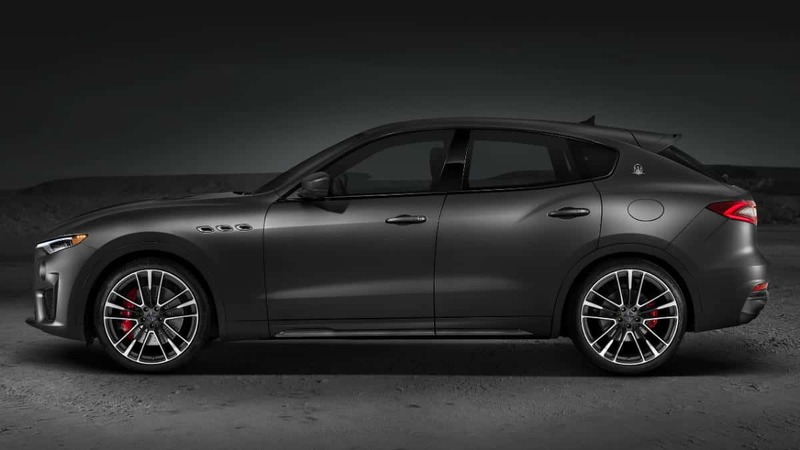 The fastest Levante in Maserati history is initially intended for overseas export markets, including the U.S. and Canada. Maserati engineers developed the mighty 3.8-litre Twin Turbo V8 engine to accommodate the Q4 Intelligent All-Wheel Drive system, providing it with a new crankcase design, specific crankshaft assembly, new oil pump and auxiliary belt and a different wiring layout. New turbochargers feature increased flow, while redesigned cylinder heads with specific camshafts and valves, different pistons and new connecting rods allow the ability to reach the maximum power targets in combination with specific engine calibration mapping. The Levante Trofeo is definitely one of the fastest SUVs ever built with a top speed of over 300 km/h. Thanks to its remarkable weight/power ratio of 3.6 kg/hp the Trofeo needs only 3.9 seconds to reach 100 km/h and only 34.5 meters of braking distance to get back to a complete stop. The ideal 50:50 weight balance and the low center of gravity – common to all Levante models – in combination with the finely tuned double-wishbone front / Multi-Link rear suspension and the larger tires fitted to the 22-inch forged aluminum wheels, endow the new Trofeo with remarkably balanced handling and lateral stability. 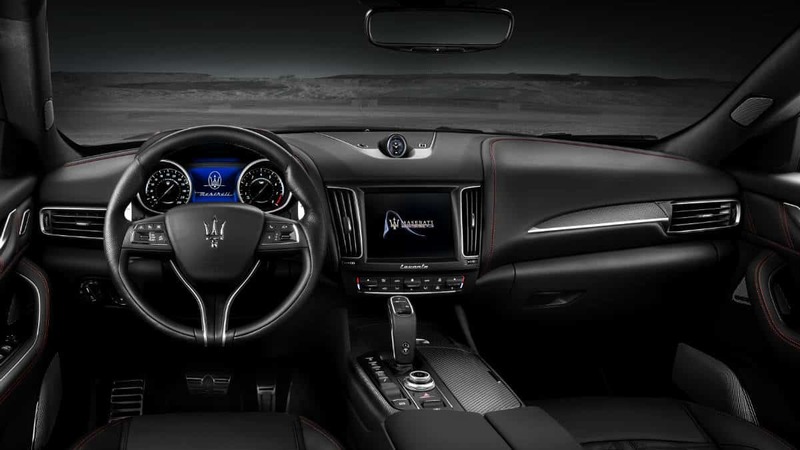 The new “Corsa” Driving mode with Launch Control functionality in addition to the existing Normal, I.C.E., Sport and Off-Road modes has been adopted to enhance the athletic character of the ultimate Maserati SUV. “Corsa” driving mode further improves engine response and opens exhaust valves in acceleration, as well as provides faster gear shifting, lower air suspension height levels, sportier Skyhook damping and optimized Q4 Intelligent All-Wheel Drive settings and interacts with Traction Control and ESP systems to maximize driving a pleasure. The Maserati Integrated Vehicle Control (IVC) system has been incorporated for the first time in a Levante, for impressive driving dynamics, better performance and a genuine Maserati driving experience, by helping to prevent vehicle instability, instead of correcting “driver mistakes” as a traditional Electronic Stability Program (ESP) system does. 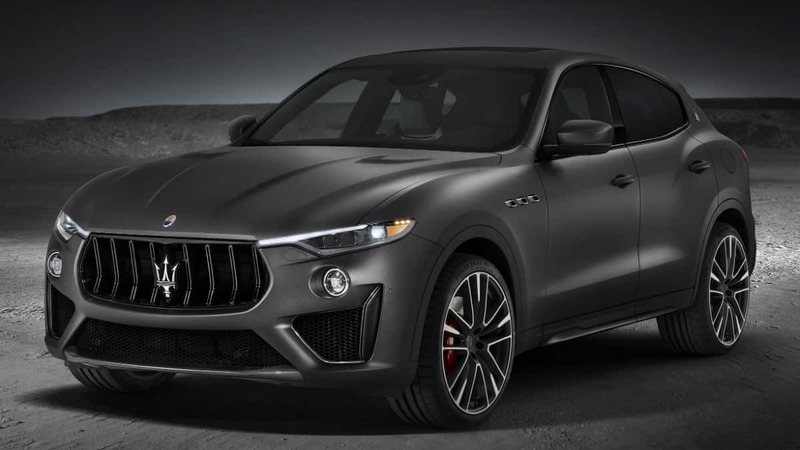 As an introduction to its upcoming new model, Maserati is showcasing a limited Levante Trofeo launch edition at the Javits Center in New York. The show car is in the special matte Grigio Lava paint with matte finished 22-inch wheels and red brake calipers. This limited series Trofeo is exclusively intended for a small number of Maserati customers in the U.S. and Canada. The Levante Trofeo launch edition will be available in eight unique exterior colors including the following exclusive exterior features: 22-inch forged aluminium wheels with three-season performance tyres or new 21-inch wheels with all-season tyres, in a gloss finish and dark details, like black daylight openings (DLO) and fog light rings, as well as Black Chrome Maserati badges, Trofeo “Saetta” logos, side air vents and trunk accent. The Trofeo launch edition interior is even more individual, featuring natural “Pieno Fiore” leather sport seats available in black, tan or red with contrast stitching. Black leather with blue or yellow stitching is exclusive to the launch edition and all feature the new matte carbon fiber wave interior trim. A serialized launch edition badge integrated on the center console featuring the customer’s name has also been added to underline the unique character of the Trofeo launch edition.